Regina Mary (Rausch) Hericks was born to John J. and Mary (Kaiser) Rausch on Aug. 22, 1932 on the farm near Hoven, South Dakota. She lived 82 years of her life in Hoven where she attended church, school, played piano and enjoyed roller skating with her brothers where she met her lifelong love, Albert. She married Albert J. Hericks on Oct. 3, 1951 and became one of the “three Regina Herickses,” all married to brothers. She was a devoted and loving wife, and mother to her 10 children, having wonderful meals hot on the table when the noon and 6 o’clock whistle blew. Albert and Regina operated Hericks Implement for over 20 years. Regina was a skilled seamstress and spent endless hours sewing her daughters’ Easter dresses, wedding, and bridesmaid dresses. She was masterful at homemaking, quilting, calligraphy, and cooking. She made the best fried chicken and green beans ever and taught all of her girls to bake Grandma Rausch’s caramel rolls. 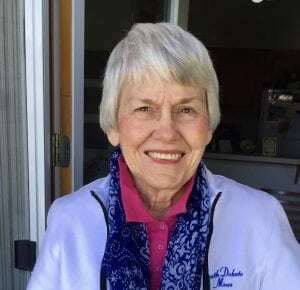 Living her Catholic faith fully, she walked or ran daily to attend Mass at Saint Anthony’s Catholic Church, attended Prayer Group, and Adoration. The Hericks house was “Grand Central Station” and she loved to have friends and relatives stop by to visit anytime. Especially fond memories are the relatives’ get togethers with delicious Lefty’s sausage following Midnight Mass. Together, she and Albert enjoyed many trips, traveling by car across the country to visit their extended family, children and grandchildren. They enjoyed playing Pinochle, Bridge and other card games. At the age of 82 she sold the family home in Hoven to move to Rapid City and lived at Primrose Independent Living. She was resident at Bella Vista Nursing Home at the time of her passing. Regina spent her last days surrounded by many loving family members, singing, praying, and walking with her as far as they could on her final journey to her heavenly home. She died with grace and faith on Ash Wednesday, March 6, 2019 at the age of 86 years due to the complexities of dementia. She leaves a legacy of laughter, love, faithfulness, integrity and wisdom. She is survived by 10 children, Marie (Don) Denelsbeck, Memphis, TN, Donna (Dale) Geyer, Loveland, CO, Jerry (Mary) Hericks, Hoven, SD, Karen (Joe) Bahr, Rapid City, SD, Kathy (Tom) Kula, Fort Collins, CO, Janet (Randy) Bohne, Diane (Mike) Golliher, and Chuck Hericks, all of Rapid City, SD, Art (Ingrid) Hericks, Coeur d’Alene, ID, Greg (Spring) Hericks, Denver, CO; her 21 grandchildren and 25 great grandchildren. She is also survived by her sister, Betty Lemler, Aberdeen, SD, and sisters-in-law, Viola Rausch, Hoven, SD, Joan Rausch, New Haven, IN, Adella Hericks, Faulkton, SD, and Marilyn Hericks, Apache Junction, AZ. Regina is preceded in death by her husband, Albert, infant daughter, Mary, brothers, Joe, Francis, and Walter and sister, Anna Marie Roesler. The Wake will be held on Monday evening, May 27. Mass of Christian Burial will be held on Tuesday, May 28 at 2 p.m. at Saint Anthony’s Catholic Church, Hoven, South Dakota, with Father Richard Fox officiating. Graveside services will be held at St. Anthony’s Cemetery immediately following. Memorials may be made to St. Anthony’s Foundation. Arrangements are with the Osheim and Schmidt Funeral Home of Rapid City and Lien Funeral Home of Bowdle.